Keeping blood sugar levels under control is hugely important for women who either have diabetes going into pregnancy or who develop diabetes during their pregnancy. Tight blood glucose control helps increase the chances of a successful pregnancy by cutting the risk of complications for your baby. If you have diabetes, one of the ways your doctor or nurse will monitor your glycemic control is by carrying out a HbA1c test. The HbA1c test measures glycated haemoglobin - a molecule within red blood cells that naturally bonds with glucose - to get a good indication of your average blood glucose over the past 8-12 weeks. This guide outlines when your HbA1c readings will be taken and what HbA1c values should be before (planning stage), during and after your pregnancy. The NICE guidelines for Diabetes in Pregnancy (Clinical Guideline 63) state that women with diabetes should aim to achieve an HbA1c result of 43 mmol/mol (6.1%) or lower. If you are planning to become pregnant, you should be offered an HbA1c measurement on a monthly basis to help monitor your blood glucose control. Meeting the target will help to minimise the risk of the baby developing risk of congenital malformations. If you have an HbA1c above 10%, it is strongly advised to avoid becoming pregnant until good diabetes control is achieved and sustained. During the first trimester of pregnancy, the HbA1c target for women with diabetes is the same as for planning a pregnancy, that is 43 mmol/mol (6.1%) or lower. During the second and third trimesters of pregnancy, from week 13 onwards, HbA1c should not be used for assessing blood glucose control. How to lower HbA1c before pregnancy? Help! If pregnancy has occurred unplanned, it is important to aim to reach the HbA1c target of 43 mmol/mol as soon as possible. Some women may find this difficult. In this case, it is best to aim to get as close to the target as possible. Try not to worry if you are failing to meet the target and work with your health team on ways you can get close to the target without becoming stressed or overly anxious. Women with diabetes can return to their normal recommended HbA1c levels of 48 mmol/mol (6.5%) or under after the pregnancy. 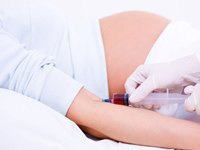 HbA1c is not used for diagnosing gestational diabetes. Pregnant women without diabetes will be screened for possible gestational diabetes between weeks 8 and 12 of the pregnancy and an oral glucose tolerance test (OGTT) will be carried out between weeks 24 and 28. If you have had gestational diabetes during a previous pregnancy, you will be given an OGTT between 16 and 18 weeks and then at 28 weeks.